What Are Permanent Teeth in 1 Day? If you are missing most or all your teeth, or suffering from an ill-fitting denture, there is a long-lasting solution known as Teeth in 1 day or All-on-4® dental implants. This special newly innovative technique replaces all your upper or lower teeth by just 4 implants and a fixed denture. This technique is very affordable and cost efficient even if you have inadequate jaw bone. All-on-6 option is also available. 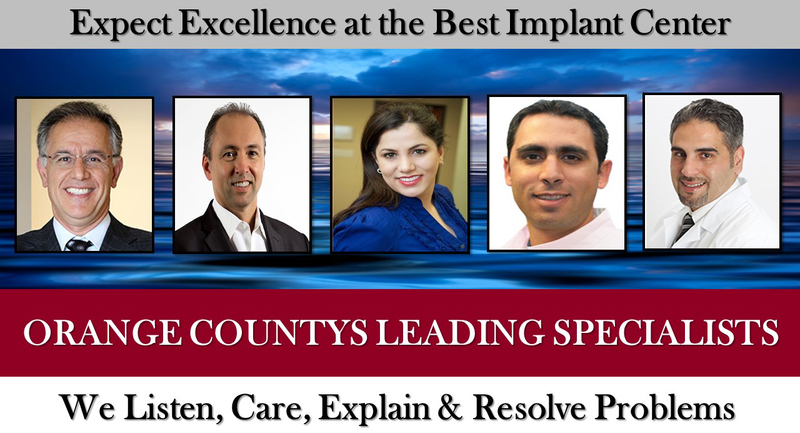 Dr. Maryam Horiyat and our team of American Board-Certified Periodontist or Implant Specialists provide individualized treatment option that are tailored to meet your needs and goals, ensuring the best outcome and long-term success. Do you want to have a full set of new natural-looking teeth in just 1 day? It seems impossible, but it is true. To learn more about a permanent set of natural-looking teeth at Aria Dental of Mission Viejo and to enjoy beautiful, comfortable, affordable, and functional teeth with just one procedure, call (949) 364-9600 or for an appointment with top orange county implant dentists at Aria Dental of Mission Viejo. 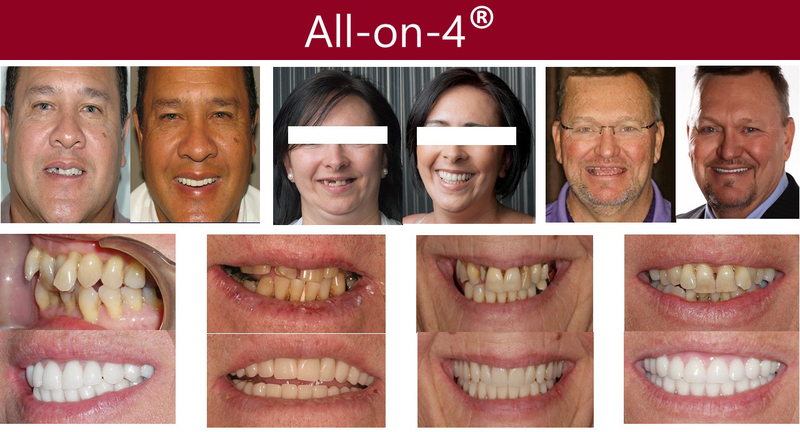 Maintain optimal oral function and aesthetics with All-on-4®, also known as same-day teeth replacement. 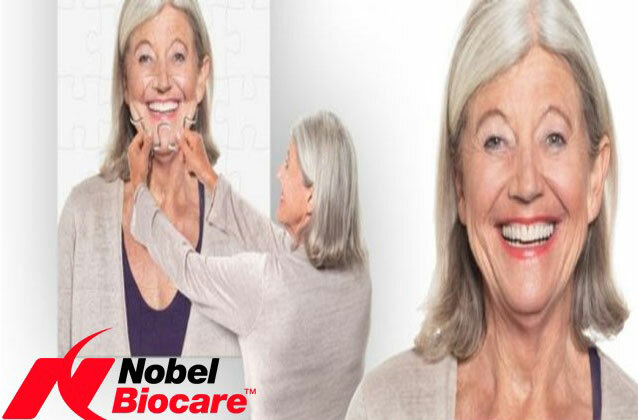 Using state-of-the-art technology, All-on-4® treatment replaces traditional dentures, which can be uncomfortable, inconvenient, and poorly fitted. All-on-4® turns problematic chewing and speaking into relics of the past. Using only four dental implants to attach a full dental restoration, your doctor can give you the stable, functional, and cosmetic solution you've been looking for. Best of all, you have a set of teeth during procedure and many cases your dentures can be placed on the same day as your implants, so you don't have to wait to get the restored smile you deserve. Because All-on-4® allows full-arch restoration with only four implants, your treatment and recovery time are greatly reduced. 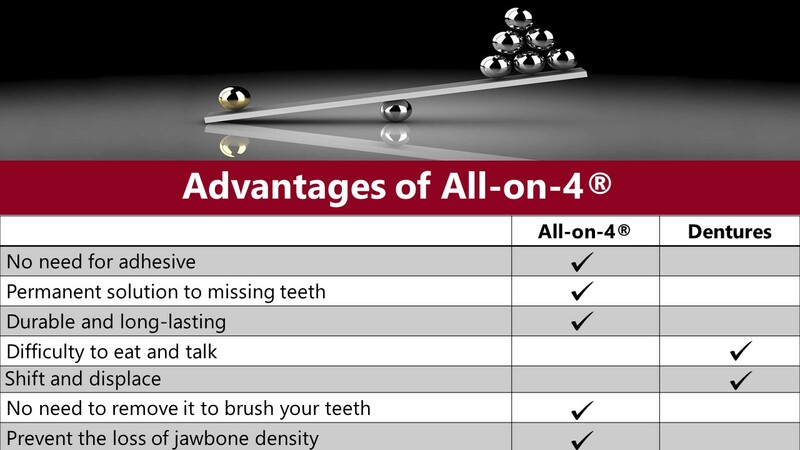 All-on-4® lowers the need for bone graft surgery while ensuring greater stability in the existing bone. It can even be used for patients who have been told they do not qualify for implants due to bone loss. The All-on-4® solution is more comfortable than traditional dentures because All-on-4® implants are more secure and feel like natural teeth. 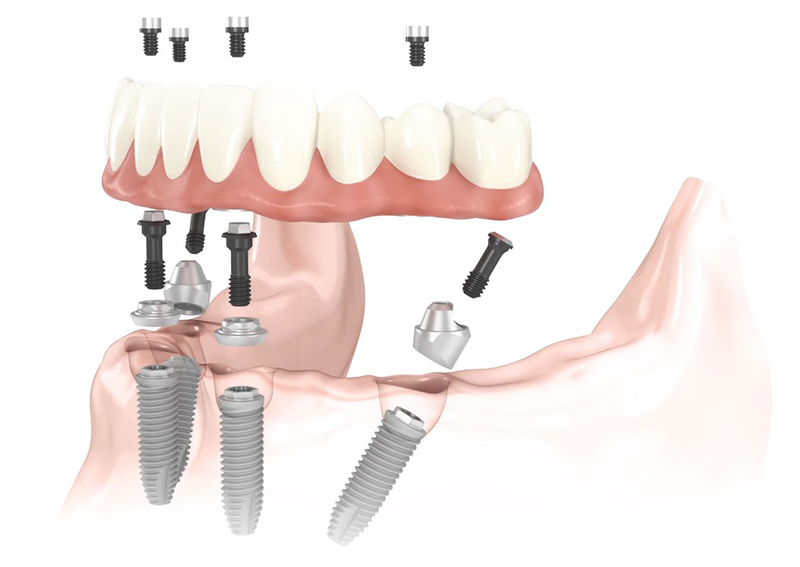 Like other implant procedures, All-on-4® technique is successful with the success rate being reported as 98.5%. RAPID IMPROVEMENT IN QUALITY OF LIFE: A fixed full-arch prosthesis on the day of surgery quickly leads to improved patient satisfaction – with regards to function, esthetics, sense, speech and self-esteem. SHORTER HEALING TIME: Tilting of the posterior implants avoids the need for time-consuming bone grafting procedures, while immediate loading shortens time-to-teeth. LOWER COST: The concept is the least costly in comparison with conventional implant treatment modalities of the edentulous and soon-to-be edentulous jaw. 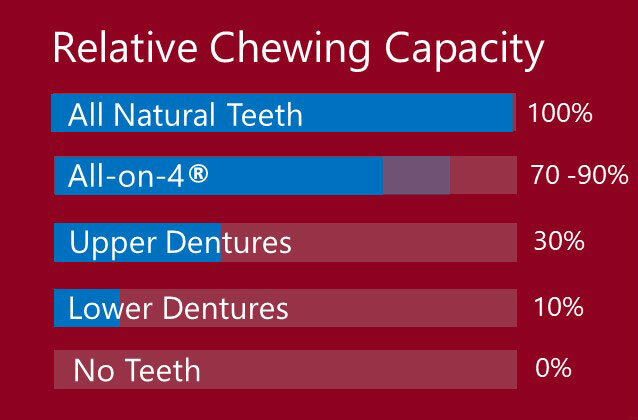 STRENGTH: All-on-4® denture can be made from Zirconium, which is known as the strongest dental materials with highest natural look with less need of bone grafting.